For experienced woodworkers, DIYers and hobbyists, the chainsaw is a natural and essential tool that they cannot do without. This power is very useful for various professional and around the home projects, and so it is vital to keep yours sharp and ready to use. When you think about keeping chainsaws sharp and in great cutting condition, a chainsaw sharpener should be the first thing that comes to mind. Chainsaw sharpeners are handy tools that you will end up using a lot because chainsaws hardly ever stay sharp for long, and this is more so for those that use them a lot. But, before you go out to buy one, you should note that they come in various types from electric to the more affordable handheld ones. 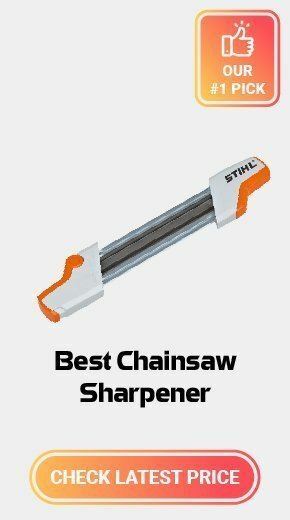 Finding the best chainsaw sharpener will require you to understand these types, and also take several other factors into account. Whether you plan to buy your first chainsaw sharpener or upgrade what you have, this guide is for you. We will review some of the best ones, and also explain how to pick the best chainsaw sharpener for the money. You can also read other product reviews such as chainsaw, chainsaw chap, Worx jawsaw, pruning saw, pole saw, and many more. A sharp chainsaw is a more efficient and fast cutting tool, and to keep yours sharp you need a good sharpener. In our table below, we compare 10 best-rated chainsaw sharpeners in the market to help make it easy to find one that suits your needs. If you are an occasional chainsaw user that requires a chain sharpener for occasional use, the Oregon 410-120 is a great choice, and its performance will never disappoint you. You can mount it on either a bench or wall which makes it quite convenient. And it will sharpen chains with a pitch of up to .404. This top-rated chainsaw sharpener comes with a built-in light to make it easy to see what you are doing and it uses a one-way motor. The two features combine to provide a significantly safer operation. The easy-to-use adjustments also help to make this one of the best electric chainsaws out there as they ensure it will be easy to use even for beginners. You can also use it to sharpen almost any kind of chainsaw chain as it comes with three different grinding wheels. Its new sprocket nose system ensures that you will get a longer nose life and hence a more durable sharpener, and also helps to improve the overall performance. With a grinding speed of 4,200 RPM, you can be confident of fast chain sharpening and hence minimal downtimes when using the ECSS by Buffalo Tools. It is also a highly versatile chainsaw sharpener that is designed to adjust to the design of almost any chain type, and so it will be very useful for those with different chainsaw types. Although many users will end up mounting it on a workbench, it is also mountable on walls or vise to make it more convenient to use. This 85-Watt chainsaw sharpener will plug-in to a standard 120-Volt power outlet, and so you will not need to make any special power connections. It will use a 4-1/4 x 1/8 inches grinding wheel and with a 7/8-inch arbor to deliver a versatile performance. Although it still takes a learning curve to master it, the chainsaw sharpener will deliver a relatively simpler and more efficient operation within a short time. For those that do not have a lot of experience sharpening chainsaws and are looking for something that will not give them a hard time to use, the Stihl 2-in-1 file is a great buy. It is designed to sharpen both the tooth and depth gauge at the same time, and this helps to speed up the sharpening process and deliver more consistent results. The tough, well-designed and sturdy construction makes this one of the best manual chainsaw sharpeners out there. And it is also quite lightweight to make it a highly portable chainsaw sharpener for carrying around when working with your chainsaw. The files on the sharpener are available in different sizes to work with a variety of chainsaw types and brands, and they are also removable for easy cleaning. Granberg G-106B is an excellent product for users on the hunt for a professional chainsaw sharpener, and this is despite the fact that it is a manually operated sharpener. If you have some little experience sharpening chainsaws and set it up well, you can expect to get edges that are almost as good as what you would get from the electric chainsaw sharpener. This relatively affordable sharpener is made with die cast aluminum and zinc-plated steel, and so you can be sure of getting many years of service. It is designed to mount on any saw and it will hold any file size to work on standard chain pitches and lowering depth gauges. Also, it has calibrated swivel markings to help ensure it sets and holds the correct sharpening angle. There are also other integrated features on this bar mounted chainsaw sharpener that will allow users to set the tool length and file height for even more precise sharpening. This Drixet sharpening and filing kit is designed for those that do not use chainsaws a lot and only need soothing for occasional sharpening. It is a manual chainsaw sharpening kit that comes with everything you need to sharpen various types of chains. The kit includes both round and flat files, a hardwood handle, a guide and handy tool pouch that will make the piece easy to organize and store. It is the cheapest item on our chainsaw sharpener reviews, and so it will be a good buy for users shopping on a tight budget. But, despite the affordable price tag, the files are well-made from high-quality steel, and so you can be confident you will be using them for a long time. Although this automatic chainsaw sharpener is the priciest on our list, you will get what you pay for as it is also a highly efficient sharpening tool. It runs on a more powerful 3-Amp motor that delivers enough power to the grinding wheels for fast and more efficient sharpening. The chainsaw sharpener comes with some easy to use controls that make it simple to use even for beginners. And it has three different grinding wheel thicknesses which are 1/4, 1/8 and 3/16 inch. Although it will still allow for equal grind angles without having to make adjustments, it also has new adjustment capabilities to ensure you get accurate grinds even as the grinding wheels wear out. This chainsaw sharpener will also come with a wheel dressing brick and a template to help you with depth gauge setting and wheel contour. As long as you have a car or anything that has a battery like a lawnmower, you can use this handy 12 Volts chainsaw sharpener to restore your chainsaw's edge. This battery-powered sharpener comes with three grinding stone sizes to make it ideal for a variety of chain sizes, and it is also lightweight and highly portable. It is made with an anti-aging and anti-impact cover that helps to increase its lifespan and will stay cool when the sharpener is in use. Also, the chainsaw sharpener comes with a spindle lock that is very convenient as it makes grinding stone changing faster and easier. If you prefer a cordless chainsaw sharpener, this one from Timberline with its carbide cutter will impress you as it delivers fast and highly precise sharpening results. This manual chainsaw sharpener will sharpen the chain while it is still on the saw which can be very convenient when you do not have a lot of time to spare for sharpening. The tungsten carbide cutter is also tuned by hand using the built-in handle, and this also helps with ease of use and speeds up the sharpening. The carbide guides on this chainsaw sharpener are fixed at a universal 30-degree angle which will suit most chains but you can still get 25 and 35 degrees guide if you want. And because this chainsaw sharpener will only remove a small amount of material from every tooth, you can be confident that your chain will last much longer. For an electric chainsaw sharpener, the XtremepowerUS Mini is as affordable as they get and you will hardly get anything better without spending more cash. It runs on a relatively more powerful 85-Watt motor that delivers speeds of up to 4,200 RPM for fast and more efficient sharpening. This highly affordable chainsaw sharpener is bench-mounted to provide a more stable base for sharpening. And it comes with a pivoting head and adjustable vice angles both to the right and left for more versatile sharpening applications. There is also a brake handle that helps to hold the chain in place when sharpening to provide more precise and accurate results. Here is another portable chainsaw sharpener that you can use to sharpen your chainsaw from almost anywhere provided you have any 12 Volts battery. It is an easy to use chainsaw sharpener that comes with two different sharpening stone sizes for increased versatility. And it also includes quick-adjusting sharpening guides that will help ensure you always get uniform and consistent edges. The built-in depth gauge is also quite handy and you can be confident of using this tool for long thanks to the high-impact motor house that makes it highly durable. Besides ensuring that you always get an excellent cutting edge on your chainsaw, it is also one of the cheapest models on our list. If you have been using chainsaws for long enough, the chances are that you already have a preferred sharpening tool. But, it might still not be giving you the best service. When it comes to buying a chainsaw sharpener, one of the first things that you need to understand is that they come in different types. The three main and most common types are electric, handheld file and the bar mounted chainsaw. Each will have both advantages and shortcomings which you should use to decide which type to buy. Electric chainsaws are the fastest, efficient and most precise of the three types, and they are what many professionals prefer to use nowadays. These chainsaw sharpeners are also the easiest to use, and they will almost not require any muscle power when sharpening. With the electric chainsaw sharpeners, the chain is clamped between a guide bar that helps to keep it in place and ensure proper sharpening angle. Once you start sharpening the wheel will move at a consistent speed to sharpen your chain with consistent angles and length. However, these chainsaw sharpeners tend to be the most expensive and the setup can often be quite confusing and this is more so for beginners that are using them for the first time. The handheld file is probably what comes to most people's mind when they think of a chainsaw sharpener as it is the most common. It is the most basic chainsaw sharpener type, and as its name suggests it is just a simple sharpening file that comes in varying diameters to suit different chain sizes. These sharpeners are the simplest to use as you just have to run them over the tip of your chain. However, this movement will require some muscle power and precision and requires practice to master. Also, you have to take extra precaution when using these sharpeners to ensure you do not damage the chain's cutting angle, and this means that sharpening is often a slow and time-consuming process. While the bar mounted chainsaws are not electric, they offer a more intensive sharpening process than the handheld file sharpeners. These sharpeners require a flat and stable platform like a workbench or table to be used effectively. And their most common feature is the knobs that you use to set the saw according to the manufacturer specification for depth and filing angle. With these chainsaw sharpeners, you use a hand crank to move your chain through the sharpener after setting it in place. Although with these sharpeners you get a relatively more precise sharpening without the need to worry a lot about precision and control, you have to remove the chain to sharpen it. For many chainsaw users, this often translates to longer downtimes. Buying Advice: If you are a seasoned woodworker that uses the chainsaw a lot, the electric sharpener is by far your best buy, But, if you an occasional use the cheaper handheld file or a bar mounted sharpener can still work well for you. Power often applies when buying the electric chainsaw sharpener, and the more powerful the sharpener is the better it will be for sharpening. Different electric sharpener models will come with different motor sizes which often range between 75 and 300 Watts. But, it is also important to note that in most cases the more powerful the motor the pricier the sharpener. Also, check the RPM that the motor can generate because the higher it is the faster the sharpener will sharpen chains. You do not want to spend your money on an expensive chainsaw sharpener only for it to break apart after a few months. And so like with everything else you need to consider the sharpeners quality of construction. A good chainsaw sharpener is one that can withstand regular use and is rugged enough to survive the typical job site abuse. If you are looking for something that can withstand wear and tear for a long time, heavy-duty metal construction is what to go for, and avoid those made with cheap plastic materials. Not all chainsaw sharpeners can sharpen different chain sizes, and this is more so when it comes to the handheld file sharpener. Hence before you settle for any sharpener, you should make sure that it is meant to sharpen the particular chain on your chainsaw. Most modern electric chainsaw sharpeners can be adjusted to handle different chain sizes, and if you have many chainsaws models with different chain sizes they are the best choice. How often you will be using your chainsaw will have a massive effect on the right chainsaw sharpener for you. For those that use chainsaws more frequently and hence need to sharpen them more often, the electric ones are the best choice. Although getting one means spending more, it will be worth it as it will speed up the sharpening and provide more consistency and precision. But, if you only use your chainsaw occasionally you do not need to spend a lot of money on electric sharpeners because the handheld file is often enough. For some casual chainsaw users, a dull chainsaw means that they will stop using it and others will go out and buy a new chain every time their gets dull which is just a waste of money. It is true chainsaw sharpening can be a daunting task at first but once you get used to it and learn how to do it correctly, it will even become an interesting activity. Here is how to sharpen your chainsaw in a few simple steps. The first step is deciding on the most appropriate sharpener for working on your chainsaw. And besides making the obvious choice between electric, handheld and bar mounted sharpeners, you also need to decide on the shape of the file you prefer. Also, choose the right file guide to go with your sharpener. Most chainsaw manufacturers will specify the right guide, file or stone size for sharpening their chains. This information is listed in the manual, user guide or packaging depending on the manufacturer. In case you cannot find the file size recommendations, you can always look up the information online or even contact the manufacturer. However, most chains will require 3/16, 5/32 or 7/32-inch file size. And if you are using an adjustable electric chainsaw sharpener you can set it to any of these sizes. It is important to know where to start sharpening and finish because you do not want to sharpen the same spot several times as this can lead to over-sharpening. The best way to avoid this is to start sharpening at the special link which is a link that is different from the rest in most chains. In some instances, the link will not have teeth or it will be a different color from the rest. Sharpen the chain as you advance forward until you get back to the special link and this will let you know that you have sharpened the entire link. If your chain does not have a special or unique link you can mark your starting point with a marker. Sharpening a chainsaw and this is more so when using a handheld file will require you to make even and firm motions. Start by aligning your file to the same angle as the blade and then make sure that you apply even pressure throughout as you are moving back and forth. You will want your hand to remain firm to ensure uniform and professional results throughout the chain. Owning and using a chainsaw always involves maintenance and for this, it is always important to sharpen the chain periodically. While there are many ways of sharpening your chainsaw, all will always involve the use of a good chainsaw sharpener. And finding one should now be easy with our guide above. All it takes is to understand the advantages and disadvantages of the different types of chainsaw sharpeners and considering factors like power, chain size and frequency of use. And with our top 10 best chainsaw sharpener reviews above for high-quality recommendations, getting the perfect tool to keep your chainsaw sharp and in peak performance should be an effortless task.